When Sardar Sant Singh, now 87, settled in Lahore about a decade ago, his was the first Sikh family to do so after 1947. He heads a prosperous joint household of four sons and many grandchildren who all live in a spacious house they own in a suburban middle-class locality. All his sons also own their independent businesses; one of them is an elected councillor and another is a member of the district assembly. His grandchildren travel in family-owned cars and attend private schools and colleges. This is a far cry from what Sardar Sant Singh’s life was like 17 years ago in his small village in Orakzai Agency near Pakistan’s border with Afghanistan. He used to till a small piece of land but had to run a small grocery shop and do some tailoring on the side to make ends meet. In more ways than one, the move to the big city has truly paid off for him and his offspring. 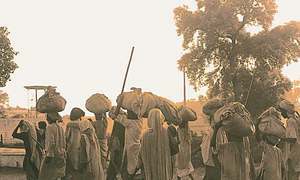 But what is perhaps most interesting about this family’s story is that, while moving from anonymity in the tribal areas to the urban prominence they have now achieved, Sant Singh’s family does not seem to have faced the usual hurdles reported in the case of other minority communities attempting similar social and geographical moves. Their journey has been rather smooth, and in tune with changes in the broader place of Sikhs in Pakistani society. The community’s visibility has increased, they are joining public services –including the police and the army – and Sikh-run businesses are no longer an oddity. Sardar Sant Singh’s eldest son, Bishan Singh, who started out working as a tailor in Peshawar, is now one of the owners of a successful outlet that peddles imported saris and embroidered wedding outfits inside a fancy shopping mall in Lahore. “It is all because of the years of hard work that my father put in,” says Bishan’s amiable young son Tarlok Singh who because of his father’s illness divides his time between working at the showroom and preparing forhis intermediate examination. Bishan’s first big initiative, the one that launched the turnaround in his family’s fortunes, was sending his youngest brother, Ameer Singh, from their Orakzai Agency village to Nankana Sahib for school in the early 1990s. “We were the only Sikh family in our village of about 4,000 people. Everyone treated us extremely nicely. 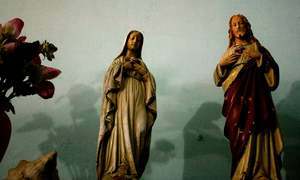 But there was no way to educate our children, especially with a religious focus,” he explains. And he did not stop there. Next he shifted the entire family to Nankana Sahib, which houses some of the most sacred Sikh sites. There the children could learn more about their religion as well as the wider world, and the elders could enjoy a better community life because of the sizeable Sikh presence. The other half of the story has its origins in Bishan’s decision to move to Lahore for work. He found a salesman’s job at a wholesale cloth market inside the walled city. Having to fend for parents, siblings and children, he worked day and night for the next five years, mastering his trade in the process. This mastery, however, could have led to nothing but a steady job but for some benign intervention. 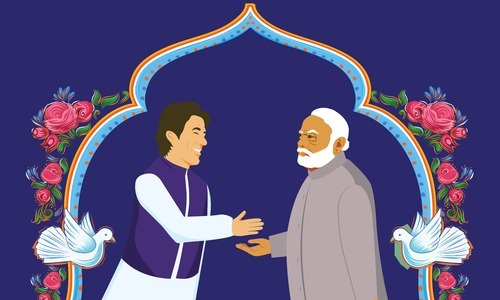 A Muslim shopkeeper – Tarlok calls him Shah Ji – who ran his tobacco business near where Bishan worked became good friends with the Sikh salesman. One day Shah Ji “gave my father one million rupees to start his own business,” says Tarlok. This was perhaps the biggest break of Bishan’s life: in a few years, he was able to return Shah Ji’s money and expand his business to the point where all his brothers and his eldest son now have separate shops of their own in different parts of Lahore. He is extremely grateful to his benefactor,who he calls his Muslim brother. “He is like a family member. We participate in each other’s happy and sad moments like relatives do,” Bishan says. This success also enabled him to do something for his own community. He became a member of the Sikh Gurdwara Parbandhak Committee, the highest management body that takes care of Sikh shrines and temples in Pakistan. He also set up his own Baba Guru Nanak Ji Welfare Society and joined a number of organisations working on interfaith relations. But despite his optimism and all his success, being non-Muslim in an overwhelmingly Muslim country poses some challenges that even Bishan has not been able to resolve. Tarlok is generally satisfied with arrangements for his community to pray and worship, explaining that “we either go to Gurdwara Dera Sahib (next to Lahore Fort) or we take Guru Granth Sahib (the Sikh holy book) to our homes to pray in front of it.” But his father wants this changed, demanding that the government unlock an existing gurdwara in Model Town area so that Sikh families living in Lahore can worship there. The place could also work as a school where Sikh children – there are now 55 to 60 in the city – could learn Gurmukhi, the Punjabi script that sacred Sikh texts are written in. “The government has already allotted us a place for cremation of the dead. Now we expect the government to open the gurdwara and let us start Gurmukhi classes there,” Bishan says. If that comes about, his family will achieve another first - getting a neighbourhood gurdwara going again in Lahore after 1947. Momentous as this sounds, it might actually come about: Bishan’s community receives significant state attention relative to other non-Muslims in Pakistan. When Sikhs have been in trouble, such as having to leave Bajaur and Malakand due to the Taliban’s activities there, the state has moved swiftly and effectively to shift them to safer places and provide sustenance. And when there have been religious disputes between Sikhs and Muslims, the administration has tried to dampen them without causing much damage to either group. A protest some years ago by college students in Nankana Sahib, for instance, became riotous and was initially reported to have been targeted at Sikh shrines and businesses. 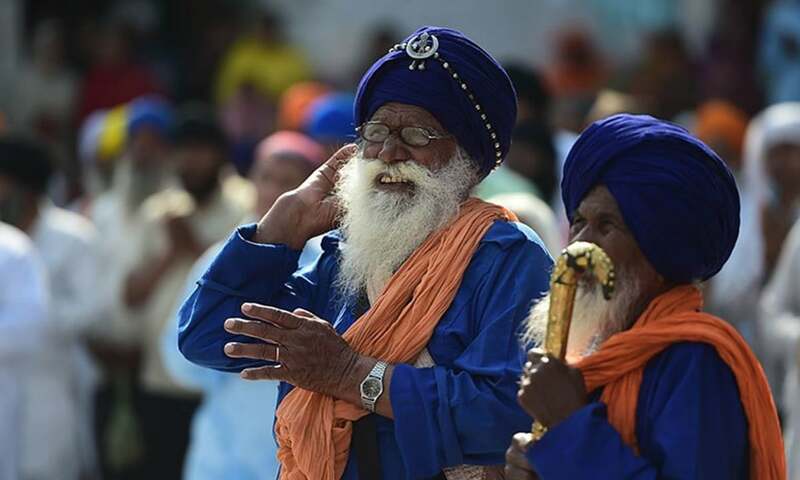 The official response was unusually swift and strong: the leaders of the protest were quickly arrested and sent behind bars, while prominent members of Punjab’s Sikh community were brought out before the media to smooth over any religious tension. When Bishan Singh, as a leader of his community, says that the Sikhs “are taken good care of”, he is simply verifying all this. Even though there are no more than about 12 Sikh families now living in Lahore, Bishan and his family claim they do not feel isolated. “We are invited to wed-dings and religious festivities by our Muslim neighbours and fellow traders and no one ever bothers about us being any different.” His son Tarlok is even more confident about his sense of association with the city and its people. “It is our city,” he says. “I don’t think I will feel as much at home anywhere else in the world as I do in Lahore.” He would like to visit India, but “only to see our holy places. I want to live with people I know well. I want to live with people I played with and studied with, and they are all here in Pakistan." This was originally published in the Herald's August 2009 issue. To read more subscribe to the Herald in print. What a feel good story, long live all our Pakistani brothers and sisters, Sikhs, Christians, Muslims, Hindus, Ahmedi's, all of them. Happy Gurpurab (Guru Nanik's birthday) to all of our Sikh community. What kind of Propaganda is this? There are only 12 Sikh families in Lahore today. Once it was city of Sikhs and Hindus. It just shows kind of attrition minorities have suffered in Pakistan over the years. Such stories do not change the reality. People know better. It is so sad that Sikhs to come to their homeland where Nanak is born nce in an year on a visa. @Man Dont spoil the good feeling brother. Try and learn to look at positives in life otherwise life will remain miserable for you. These are truly the chosen people and the true faith. There is good and bad.As a Sikh I appreciate this beautiful story. @Man the chamber up your shoulders you call head seems quite thick. 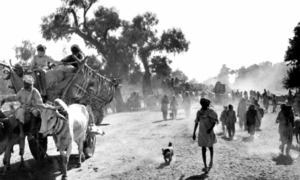 Ever heard of partition and migration in 1947??? Which propaganda? Wikipedia tells that there are around 20k Sikhs living in Pakistan in few major cities. I have visited Lahore and saw more than dozens Sikhs in 1 day in shopping malls. What? Just 12 families in a megalopolis like Lahore? Its like saying the last remaining 12 one horned Rhinos are nearing extinction and the government is trying hard to save them. Truely Sad! @Man Where did get your stats from. If there are only a few of a kind, they will of course be visible. @Man Don't you think we ought to be happy if the conditions are improving for minorities in Pakistan? Why call this article propaganda? It only states facts. @Man people like you never see any good in things. They only see the negative side and are termed as pessimistic. @Man It was sad that partition happened the way it did. We Punjabis suffered so badly. But life is lived in present. It is today that matters most. Anything happening as in this story is very good for the people of this ancient land of five waters called Punjab. @Man - Buddy, I know what you are saying but the public needs to hear good stories along with bad ones - both are part of the reality and this happens to be a real good story. Thank you dawn for balanced reporting! @Man As the Lahori Kid said: it's feel good story; nothing else. First time, I am reading such positive story in DAWN, Surprise!!!!!! Please keep the chosen people in Pakistan where their spiritual leader Guru Nanak was born and Punjab Sahib and Nankana sahib are.They will bring luck to Pakistan. Shocking .... only 12 Sikh families remain in Lahore, the capital city of Maharaja Ranjit Singh. @SUDHAKAR, USA How about Indians finally addressing the genocide of Muslims in East-Punjab and Jammu? How about giving the Muslims of Kashmir their freedom? WHY? What Happened to others? It's good to learn that people from a minority community are doing well. But this article was originally published in 2009. I want an update on the lives of those discussed and on others. @Man Your information is incorrect. There are approximately 5,000 Sikhs in Lahore and many more in other districts like Sheikhupura and Gujranwala. You are of course correct that there are many fewer Sikhs in Lahore (and West Punjab) today then in 1947. But then by the same token there are fewer Muslims in Jullander and Amritsar (and East Punjab). Please don't be negative with a story of hope and positiveness. @Vijay and its Indians with their little heart from across the border and nothing else! Sikhs are Pakistani citizens and should enjoy equal rights with no discrimination whatsoever in any way. We are so happy to read this nice story about our Sikh brothers living in Lahore.